I know a lot of people out there look down on blogging or just don't get it, but I feel so fortunate to have found all of you. Seriously, when you are having a rotten day, being surrounded (even if it is virtually) by all of you kind and considerate people definitely puts a smile on my face! Thank you all for being there for me. It means so much to know that you care! Anyway, let's talk about something a little more fun. I promised you the chowder recipe made with the leftovers from the low country boil. This was the second part to Max's birthday dinner request. The boys absolutely LOVE this soup and it is always nice to change up leftovers by making them in to something better! Remember, we made this with leftovers, so use what you have. Wether you use leftovers or make it from scratch, this is really easy and super fast. We based it on our corn chowder recipe (Um, yeah, it is embarrassing even linking to that picture...good grief it's bad!). This is so creamy and the coconut milk takes it to a whole other level. We have used almond milk in the past too and it works really well, but this combination was just made for each other! Melt the Smart Balance in a large Dutch oven over medium heat. Add onion and cook until slightly browned. Add flour; cook 1 minute, stirring constantly. Stir in milk slowly while whisking. Next add the remaining ingredients. Bring to a boil; cook until thick (about 5 minutes). I really think making foods that you can turn in to soups later is a great way to cook in general. We normally cook a huge batch of things just so we can make them in to something else. No, I don't LOVE leftovers, but I like reinventing them so I like having the already cooked ingredients on hand. Do you like cooking big batches of things to change up or do you go for the smaller portions so you don't have to deal with leftovers? What is your favorite dish to use leftovers in? Feel free to link to stuff too! I know exactly what you mean about blogging. And I am so grateful to have YOU in my life! This looks delicious Sarena! If I had potatoes, this would so be my dinner tonight! Definitely on the list for this weekend! I LOVE leftovers and I love morphing leftovers into different dishes. I will usually roast a whole sheet of veggies on Sunday and eat on them all throughout the week in salads, omlets, or mix them up with quinoa or rice for a one bowl dinners! I feel the same way about the connections I've made through blogging. A lot of people just don't understand that this is a whole different world! Less than a year ago, I didn't even know what a food blog was, and now I couldn't picture my life without them! This looks amazing! 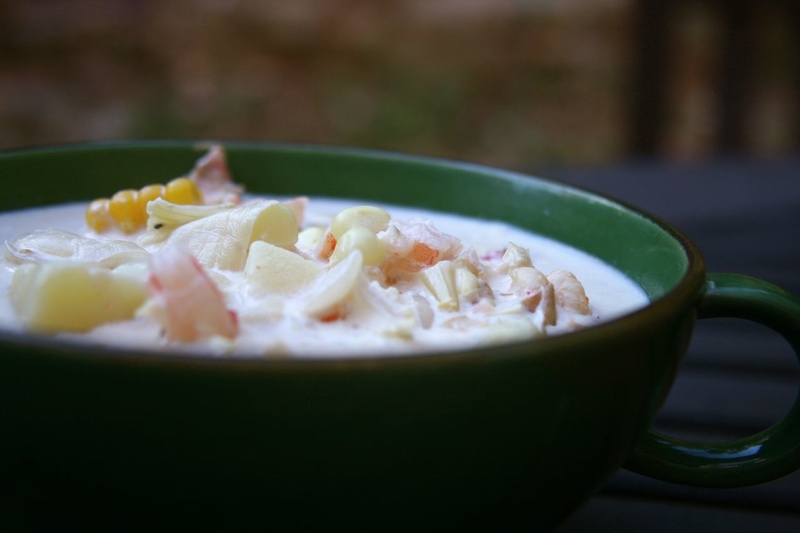 We LOVE corn chowder. Since I'm the only one that eats what I cook, I like things that make only a little bit of leftovers. It can get really repetitive to eat the same thing all the time, but on the other hand, it's nice to be able to grab something in a pinch. 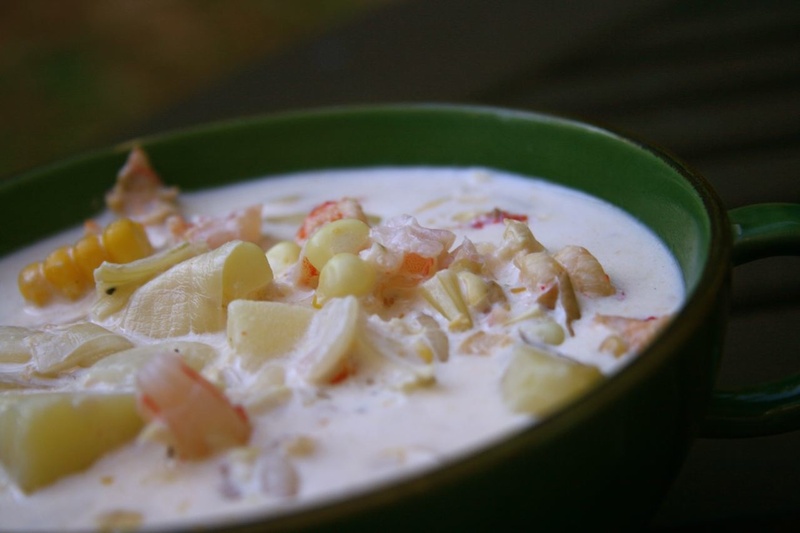 The chowder looks amazing! I really need to get better at turning my leftovers into something else---I rarely do it (and my leftovers often go bad). Hope your road to recovery is smooth and quick! Oh my goodness, a month is forever long to wait! I really hope you get some answers soon! I hear you on being appreciative to the blog world. I've been so surprised at this community here and I love it! I'm trying to be better about cooking in large batches to stash leftovers in the freezer for later - whether they are re-purposed or not. And I'm with you on the blog friendships and support. I know I have appreciated your support many many times! A month to get results back? What are they doing? Getting 100 second opinions??? oooh this looks like a mix of all my favorite things! I totally agree with your test rant. And the overmedicating thing.. But man this soup looks awesome! 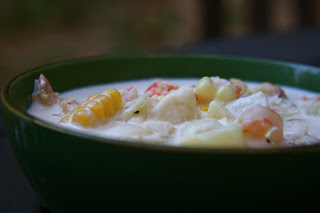 I would probably sub in some tempeh for the shrimp or something but I'm a corn chowder lover for sure! I try to make enough for leftovers for the next day (either for me for lunch or dinner the following night). I don't mind leftovers -- it makes it easy for me! I agree with you about having this community when things are rough! I love chowder, and this sounds perfect. The idea of using the boil leftovers is sheer genius! I completely agree with you. Although some of my real life friends don't understand blogging at all, I'm so grateful for all the friends that I've made through it. You included! Although I guess you're a real life frien too! Wow, that's a long time to wait for a test. I hope the belly issues just work themselves out. I don't know what I would do without my fellow bloggers. Some of them are my best friends! Yum! That looks delicious! I love cooking large amts and turning leftovers into soup, too. But this soup looks so tasty, it's worth a first run. Thanks for sharing and for offering the e-mail option. So glad the dr's visit went well...but, good Lord! a month?!? that is absurd. I love the coconut milk in this. Kinda sweet tasting, right? No news is better than bad news. Praying for a good result! i love bogging for the same reason. i love my internet friends, haha :) the chowder looks so good! A month!? I'm the queen of medical tests and have never had one that took that long to get results on. I wonder if the medical system is a bit different in areas? Yes, I love the blogger comradery, and don't really care if the offline world doesn't get it. We just made this for dinner- AMAZING! The man grew up in a dairy free house & now in his mid 20's has never had a chowder. Today changed everything. Bob's Red Mill Give Away Winners! Wednesday...where did you come from? Bob's Red Mill Guest Post and a Give Away!